Love the skirt and with the green cardigan its a great match. The green piping is a clever idea too. Beautiful job! I always lurk to see if you have a new post up. I admire your talent for sewing and also for styling. Your garments are always lovely and so are your children. I love this skirt and the piping really lifts it. May was such a good issue that I don't think I even noticed this skirt hiding among all the other good patterns. My own Burda challenge seems to have fallen by the wayside because I just got too far behind. Very pretty skirt, the piping is a nice touch. 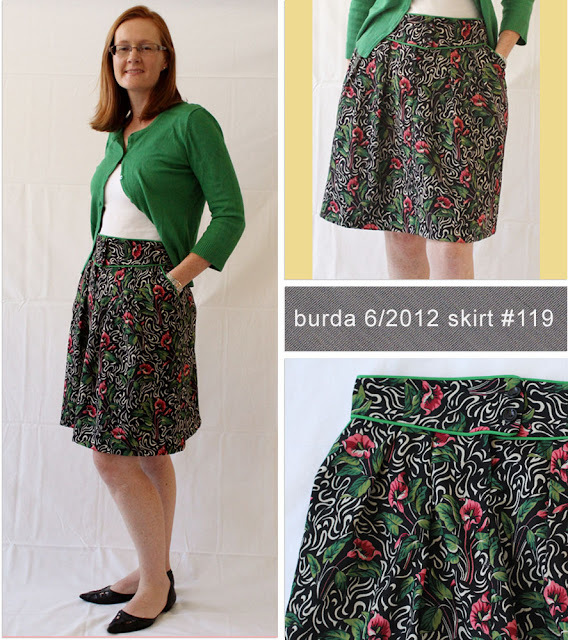 Good job on all the Burda sewing. I like this a lot, especially with the addition of the piping. Great job with keeping up your challenge! The skirt turned out lovely. I think the piping really adds something. Well done on your challenge. Lovely skirt - adore the piping. Will be a great piece for Spring. Stunning! I saw cherry blossoms yesterday...Spring is on its way. Full marks for using your stash! The skirt is beautiful on you. Lovely! The skirt is so pretty and very spring-like. I really like your skirt and the green piping is very effective. It suits you very much. Love it! Piping always makes things looks good, especially cool busy prints like this. Can I just saw how much green suits you? Love the fabric and love the piping. Green is a great colour on you, too. Very pretty fabric and the piping is a lovely touch. Lovely! Good to hear you are keeping up with your challenge and even better that you are working through your stash!! You are out-numbered, colours are in for you for the warmer weather, and I agree, that green looks so good on you. Gorgeous skirt and you can have so much fun with it with a variety of different coloured tops. Now I need to have a look at this pattern. Hard to believe that what with all the heat we are getting you guys are cold! The piping! The piping really makes this skirt sing! It is lovely on you. Congrats on keeping up the challenge, you've made some pretty pieces. Now I'm waiting to see what you loved from the August issue. That's a terrific skirt. The green sweater is the perfect color to coordinate with it. Nice work! Yay piping! I'm mighty impressed that you can keep up with two kids and find time to do a challenge like this.